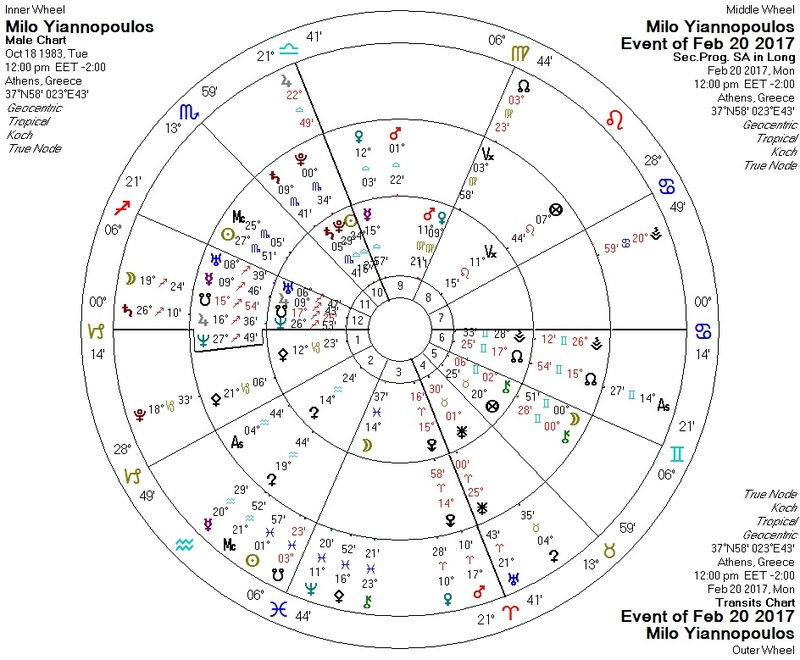 I've avoided analyzing Milo's chart here because I can't find the birth time... but I'd say his libertarianism comes from the Mercury-Pallas square and his status as outrage-magnet comes from his Libra Sun conjunct anoretic Libra Pluto conjunct Saturn in Scorpio. Today retrograde Jupiter is conjunct his Sun ("backwards" publicity) and transiting Saturn (restriction) is conjunct his Neptune (image). Transiting Jupiter is also square his progressed Pallas -- Jupiter-to-Pallas transits are the rule when questionable ethics come to the public eye. Personally, I hope he can brush this one off -- Milo has plausible deniability here and is an important voice in today's political culture.